Blue, the livery of the Foundation, is the predominant colour on stage at Oviedo´s Teatro Campoamor. A carpet with the Foundation´s coat of arms woven in yellow covers the floor. 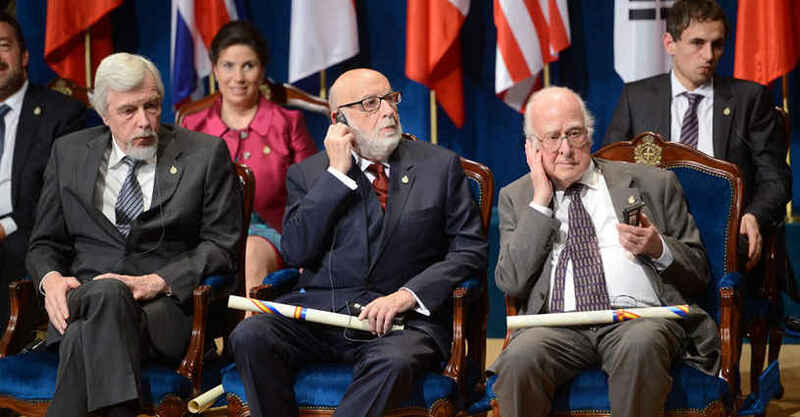 The curtain at the back of the stage is decorated with the Foundation´s coat of arms and the words "Premios Príncipe de Asturias" (Prince of Asturias Awards). The Department of Protocol at the Foundation designates the seating arrangements for the different figures on stage. 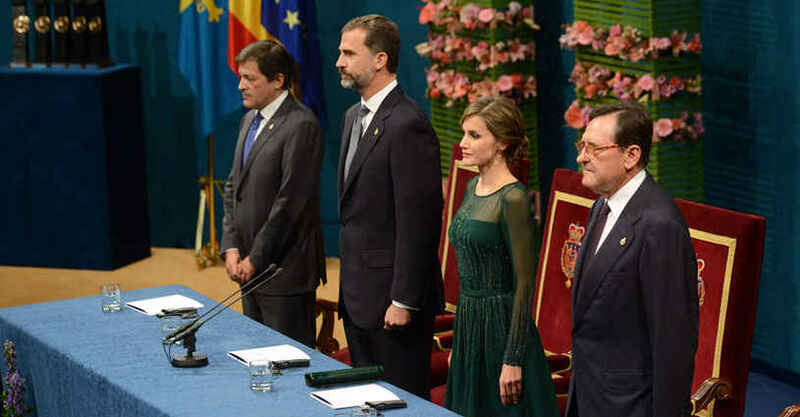 Since His Royal Highness´s wedding in 2004, the presidential table includes Their Royal Highnesses, the Prince and Princess of Asturias. The President of the Principality of Asturias, Mr. Javier Fernández Fernández, is on the Prince's right, and the President of the foundation, Mr. Matías Rodríguez Inciarte, is on the Princess´ left. The flags of Spain, the Principality of Asturias and the European Union flank either side of the table. Her Majesty Queen Sophia usually watches the ceremony from the royal Box, on the first tier of the theatre.The Award winners sit on the left hand side of the stage, with the flags of their countries of origin behind them. To the right, there are presidents of the different award juries, former Award winners and authorities.The press box is also on the right, at the back, arranged so that press photographers from the different media can photograph the highlights of the ceremony. 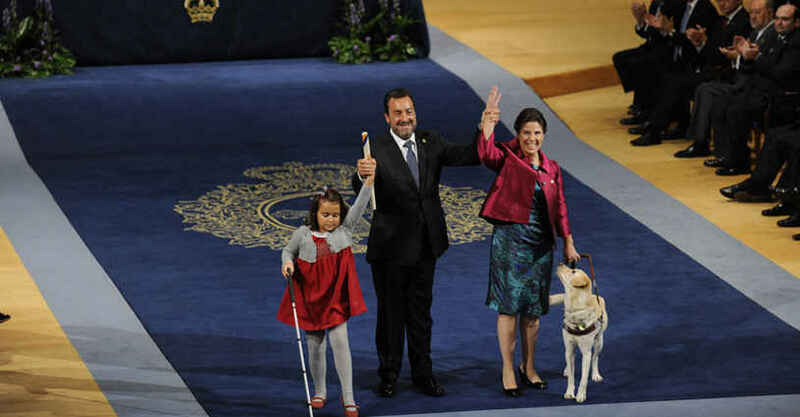 The grand presentation ceremony for the 2013 Prince of Asturias Awards is to be held on 25th October at 6.30 p.m., and it will last 90 minutes. The format is generally the same: Their Royal Highnesses Prince Philip of Spain and Princess Letizia come in to the sound of the national anthem, played by the City of Oviedo Bagpipe Band, and the ceremony gets under way. The award winners are next to come in, to the sounds of "Two Ayres for Cornets and Sagbuts" by the British composer, John Adson. Once everybody is in their place, the Prince invites the President of the Foundation to speak, and he gives a summary of the organisation's activities over the course of the year. This speech leads on to the presentation of the awards, when short fragments from each of the minutes of the Award announcements are read out. The Award winners leave their seats and walk to the President's table, to be handed the Award by the Prince. It is customary for three of the Award winners to give speeches, and H.R.H. draws the ceremony to a close by reading his speech, considered for some time now as one of his most important speeches of the year. The award winners leave the theatre to the sounds of "Asturias, patria querida" (Asturias, our beloved homeland), the anthem of Astuiras, played once again by the Bagpipe band.